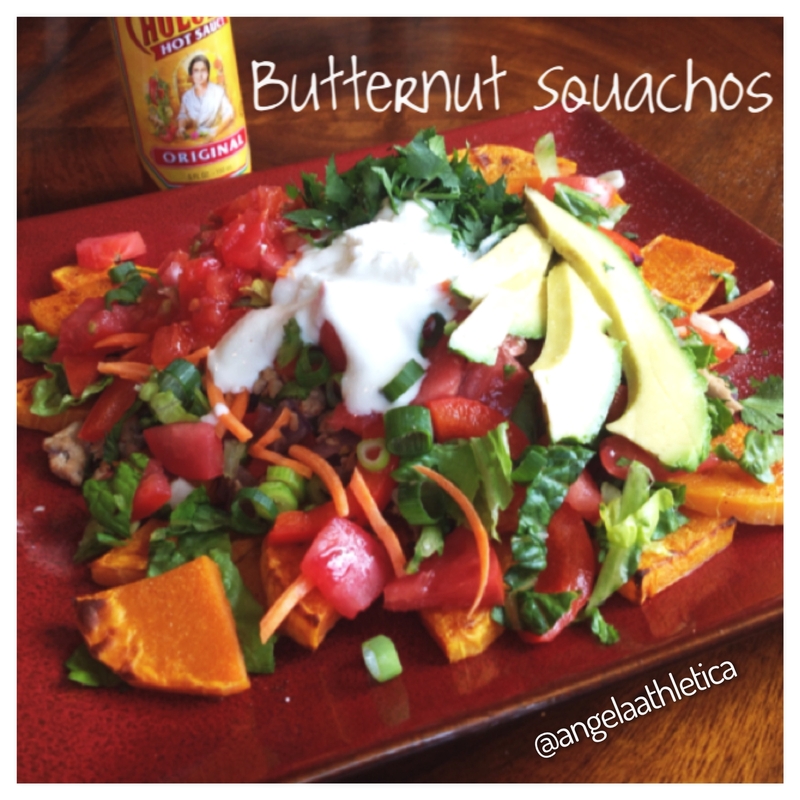 Classic Nachos turned healthy using roasted butternut squash as the tortilla chips and lean ground turkey instead of ground beef. All topped with tons of fresh veggies and greek yogurt instead of sour cream. Preheat oven to 400 F on convection. Peel butternut squash using only the top half (cut before the bulge). Slice into discs and cut disc into 1/4 a to resemble tortilla chips. Grease a cookie sheet and lay butternut squash pieces in one layer and lightly spray with olive oil and sprinkle with salt and pepper. Baked until lightly browned on top and soft in the center (about 15-20 minutes). Spray a skillet with olive oil and brown meat with red pepper and red onion over medium high heat. Add taco seasoning and set mixture aside. Lay butternut squash chips for the first layer and top with seasoned meat and vegetable mixture. Top with green onion, tomato, lettuce, carrot shreds, Greek yogurt, avocado, salsa and cilantro. Enjoy!